Wood burning stoves and fireplaces have always held a romantic and cozy place in our imagination. There is a visceral appeal to the warmth and safety a fire represents. As fall winds down, people everywhere are beginning to plan their winter escape. For most, an ideal winter escape is somewhere sunny and warm but a growing number of people are instead opting for a more rustic retreat. There's something quite magical about spending time in a quaint log cabin, nestled in between some tall pines, bordered by a little frozen creek. For many eager to leave the busy hustle and bustle of city life, a weekend wilderness getaway is perfect. After a day of hiking or skiing, there's nothing more relaxing than cozying up on the sofa in front of a roaring fire with a good book and a mug of hot chocolate. When it comes to choosing the right fireplace or stove for your winter getaway, there are a few things that you should keep in mind. 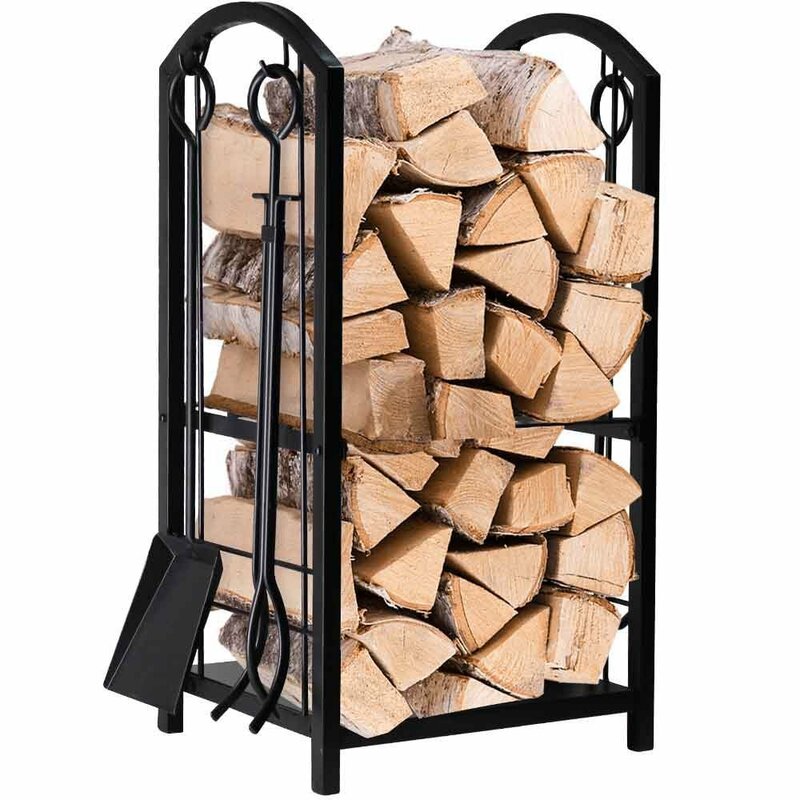 First of all, you want your fireplace to complement the rustic look and feel of your log cabin but you also want it to be safe and energy efficient. Let me break down for you some things to look for when shopping for a cabin fireplace for your home away from home. When shopping for the ideal fireplace for your log cabin, you need to think about what kind of space you have to work with. Do you own your cabin, or do you rent it? If you are an owner, you have more flexibility in the type of heating appliance you choose. You can go for a traditional fireplace, which might cost you a bit more. A traditional rustic wood-burning fireplace needs to be installed by a professional and your cabin needs to be able to accommodate such an installation. If your cabin has an old fireplace already installed but you want to update the look and feel of your space, consider a fireplace insert. A fireplace insert simply fits over your existing fireplace, allowing you to decorate the rest of your cabin without having the old fireplace become an eye sore. Fireplace inserts are also perfect if you need a new fireplace, but want to preserve the rustic look of your cabin - for instance, if you have a beautiful log fireplace mantel. 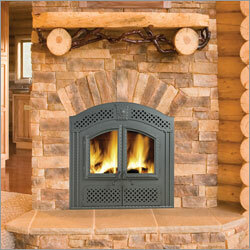 If you are renting your cabin space - you might want to consider an electric fireplace. 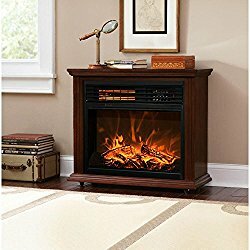 Electric fireplaces are very portable, meaning you can take it with you when you leave. Electric fireplaces come in a variety of styles and finishes, allowing you to further customize the look of your space. Purchase a TV stand or entertainment center fireplace and get the most for your money. Some electric fireplaces can even be mounted on the wall like a framed piece of art. It’s worth noting that most fireplaces are used as supplemental heat sources, meaning they likely won't heat your entire cabin, especially if you have multiple rooms. It might be a good idea to get one for your bedroom and one for your living area or invest in a couple of space heaters. 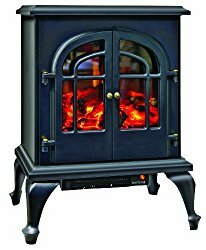 Wood Burning Stove heats up to 2200 sq.ft. A wood burning stove is probably the most rustic heating option you can get for your log cabin. Cast iron wood burning stoves have been in use for centuries and are a pretty effective heating source. While not as conventionally attractive as a fireplace, there's just something so cozy about a rustic wood burning stove! 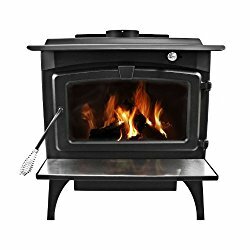 It's absolutely essential that you purchase a wood burning stove that's been certified by the EPA. EPA-certified stoves are readily available and will help guarantee a cleaner burning solution for your cabin. 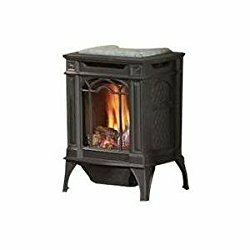 Unlike other heating appliances - it's recommended that you get your wood stove professionally installed. This will help maintain energy efficiency as well as ensure that your indoor air quality isn't compromised in any way. Also keep in mind that wood burning stoves do require more maintenance than other types of heating installations. 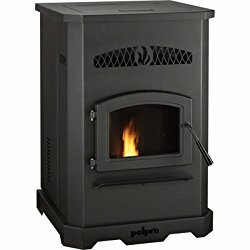 Investing in a pellet stove is a great alternative to wood burning stoves. Pellet stoves offer the same rustic look and style of traditional wood burning stoves, but burn 100% recycled pellets - made out of either sawdust or other recycled materials. Pellet stoves are easy to maintain and operate and produce very little air pollution. They are also safe and energy efficient. Gas is another great alternative fuel. Clean-burning and easy to maintain, a gas stove is a practical way to add a beautiful heat source inside your home without the inconvenience of storing wood. Instant on and instant off means you can have a fire whenever you want and you never have to worry about cleaning out the ashes or hiring a chimney sweep. As far as fuel sources go for your fireplace, there are a few popular choices for you to consider. Keep in mind, fireplaces are specifically designed to burn one type of fuel. For instance, if you purchase a wood burning fireplace, you shouldn't use it to burn gel fuel or pellets. If the fuel type is important to you, make sure that you purchase the appropriate type of fireplace. Here are the main fuel sources available in most standard fireplaces today. Wood fireplaces are the norm, in fact if you live in an older log cabin, chances are this is the style of fireplace that you have. Wood is a fairly inexpensive and a renewable fuel source, which is good. Typically one of the most inefficient styles of fireplace, today's wood-burning fireplace inserts are actually very efficient, retaining heat and producing up to 90% fewer emissions. Having a wood fireplace however requires a lot of maintenance on your part - chimney maintenance alone must be done annually, as is the case with wood burning stoves. Gel fireplaces are another popular option. Gel fuel burns clean and odorless in your space, which greatly reduces the amount of indoor air pollution. The downside is that the heat output for many gel fuel fireplaces is pretty minimal. Typically used more for ambience than as a heat source, some models of gel fuel fireplaces can heat only a small room. Gel fuel comes in cans and each can lasts anywhere from 2.5 to 3 hours each, which is not ideal for sleeping. Gas fireplaces are also very popular. 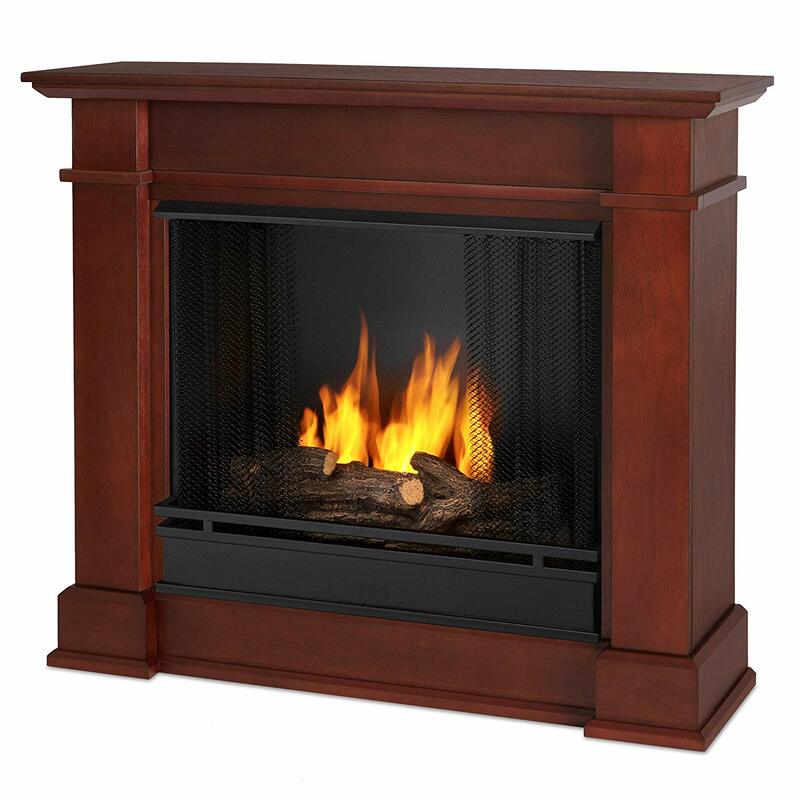 Vent-less gas burning fireplaces are portable, just like many electric and gel fuel fireplaces. Gas fireplaces are also incredibly energy efficient. Today’s vent-less gas fireplaces are designed to produce a hot flame which results in full fuel combustion, reducing the amount of carbon monoxide emissions and soot. Additionally, many vent-less gas fireplaces today are equipped with oxygen-depletion sensors that turn off the gas before reaching dangerous carbon monoxide levels. While gas fireplaces offer many benefits, some states do ban their use. Many building codes don't support the use of vent-less gas fireplaces, because of the potential fire danger and poor indoor air quality. Electric fireplaces are a viable option for renters and homeowners alike. Being portable, renters can take them wherever they go, and homeowners can move them from room to room. Simply plug it in and voila! Heat! Electric fireplaces are easy to use, install and maintain. Electric fireplaces do have the tendency to drive up your electricity costs as they take a considerable amount of power to run. Today’s log cabin owner has a wide variety of choices when it comes to fireplaces and wood burning stoves, whether they are adding an energy-efficient source of heat or simply stepping up the romantic appeal of their cozy log home.